For many years, I subscribed to the conventional wisdom that freeform radio got its start on KPFA in Berkely, the first non-commercial radio station in the country, and the cornerstone of the Pacifica Radio anti-empire. In the mid-Fifites, story has it, some late night DJs at KPFA began to experiment with formats, techniques and illicit substances, even going so far as to do the occasional audio collage! Then I heard Jim Hawthorne, and I had to rewrite the history of freeform radio, at least in my own head. In 1947 at KXLA in Los Angeles, Hawthorne was doing radio which was spontaneous, funny, eclectic and personal - in short, freeform radio, not two years after World War Two ended. Hawthorne has a roster of characters and catch phrases, but it wasn't all goofiness - he would play records backwards, at the wrong speed, and insult his sponsors, even going so far as to remix his station's commercials - a subversive practice you could never get away with on commercial radio in 2005. 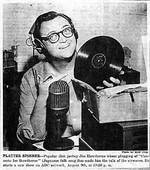 WFMU stumbled across a tape of a 1947 Hawthorne show from KXLA and aired it on the Aircheck show in July of 2003. You can hear that show in Realaudio here. But even after airing that show, Hawthorne remained a mystery. No longer - I recently found an entire site devoted to Jim Hawthorne. The man worked with some of the greats - Ernie Kovacs, Stan Freberg, Slim Gaillard, and The Three Stooge's Curly Joe. He cut numerous novelty records, one of which (Serutan Yob) went down in Novelty Record history. But perhaps the most astounding find (second to the fact that Hawthorne is still alive!) is that he participated in one of the great psychedelic kiddie records of all time, Bozo Under The Sea (click for realaudio of it from Kenny G's August 20, 2003 show). Hawthorne played the role of the swordfish. Aircheck returns to WFMU's airwaves this summer. Can't wait. I had the pleasure and honor of working with Jim Hawthorne as his engineer at KOA, Denver in the (Aack) 1980's (where did the time go?). He is not only an amazing human being, but is also the most creative person with whom I have ever worked-- the consummate broadcast professional. Listen to his shows. It is the kind of programming for which radio was born! Jim Hawthorne is indeed a radio legend, and I am a huge fan of his, having created a webpage devoted entirely to his life and career. However I must correct a couple of errors in the article listed above. Jim did NOT work with Ernie Kovacs nor did he work with the three stooges' Curly Joe DeRita. He DID star in a few Columbia shorts with Joe Besser right before Columbia stopped making shorts in the early fifties. He also informally worked with Stan Freberg early in both their careers and a transcription survives of Jim interviewing Stan on KNX radio in the 50's. Steve called, caid if I was serious he'd put in a good word for me. I called Geo Allen, (P.D)..ended up getting hired as staff anouncer, started Feb 4/51. When Hopkins folded the old Allen spot becamne the"Mel Baldwin Show". All set to go back to the big studio after a month or so..then NY called and asked who was in the olf Allen spot? Learned later, a secretary told NY, "Mel Baldwin, he's a DJ from Oregon". NY decided they need at "Name" and bought Hawth's contract from KNBC as I recall. I became the "Hawthorne Show" Director, until he left KNX..Did some skits with Hawth and Bill Norman and Don Messick in a bit acalled the "Columbia Square Table" which we originated as a take off of the old Peter Potter "Juke Box Jury", or whatever it was called. A FUN tenure for all of us. I went on to host the American airlines- KNK all night "Music 'Til Dawn" for 13 years, then the same show at WBBM in Chicago 'til it went off the air, then switched to an allnight news anchor (worst gig in the biz). Ended up with an 11 year final KNX gig as co host of the KNX Food News, retiring in 1991. Outside of that nothing much happened. Miss Hawth, but we email back and forth now,,wonderful, talented man. Anybody want to hear about Hawthorne's syndicated"Funnyworld"five minute feature which a buddy and I wrote for Jim? How it was put together? Sherm Grinsberg had the world's largest collection of old, old film clips on "stuff"..chimps having a party/riding bikes/planes crashing thru barns/idiot flying machines/head-on train crashes.. etc.This was back in the early 50's, about. I was then directing the KNX "Hawthorne Show" and staff announcing at KNX, (prior to my 13 year stint hosting the all nite American Airlines "Music 'Til Dawn" which started on KNX in '53.) My writing partner, the late Ken Finley was then Operations Director for ABC TV at the Prospect/Talmidge studios. (We had co-written "stuff" at KEX Portland before the move to Hllyd) and also later wrote Hawthorne's daily five minute Weather shot on KNBC-TV. We were tasked to write "Hawthorne's Funny World". Somebody else cut out clips and ran them together BEFORE Ken and I had seen them! We had to write Hawth's script, giving it some kind of continuity with clips running from five seconds to eight or ten! I think we did about 130 or 156 of the damn things, which Hawth managed to pull off okay. Years ago I saw them on re-runs, still! So here's another bit about Hawthorne's interesting past. Mel Baldwin is "My Hero"! I used to listen to MTD when I was a broadcasting student at WSU. His wonderful easy announcing style greatly influenced my own announcing style. We met for the first when I was attending Radio Operational Engineering School in Burbank in the late 50's. It was such a pleasure to meet him in person. Sam Schatz, who worked at KNX at the time enabled my college buddy, Allan McMillan, and I to meet Mel and Hal Owen, his engineer. Later, when I was working at KTNT-TV in Seattle-Tacoma, when vacationing in Los Angeles, I wrote to Mel and met him once again at Maples Restaurant across the street from KNX. It was wonderful! My college roommate, Dale Wile, and his fiance' used to court to the sounds of Acquaviva and then Cy Mann as they played the theme of MTD, "That's All." I would very much like to hear from Mel Baldwin if that is possible. I don't want anything from him nor am I selling anything. I want to thank him in person and tell him that perhaps unbeknownst to him, he had a positive influence on my broadcasting career. In another time, and sometimes it seems in another world, there was RADIO. It was as much a part of our lives as television was thirty years ago and the Internet is today. Born in 1942, I literally grew up in front of big and boxy radio receivers. The radio was the second most important piece of furniture in the living room; a couch was necessary for the adults to sit upon while listening to the radio. Children were relegated to the carpet, which actually provided better access to the speakers. Like most things that you are exposed to at an early age, one does not easily forget the magic of radio. As I morphed into adolescence, I still had a radio at my bedside. Late at night, there was a whole world of voices fading in and out on AM radio. From my home in Southern California, I could pick up stations all the way back to the Midwest, providing a cornucopia of content and local minutiae. And when it was time to wrap it all up, I always drifted back to the staple of my late night life: Mel Baldwin and Music ‘til Dawn. I listened to MTD from KNX, and later fought static and fadeouts, to follow his programming from Chicago. Tonight, while attempting to track some career details on another radio icon, Wolfman Jack, I stumbled upon a series of links that brought me to this site. And to a reunion of sorts with one of my personal radio idols, Mel Baldwin. Listening to Music ‘til Dawn was like having a very personal conversation with Mr. Baldwin, except that thousands of other listeners were somehow eavesdropping along the way. One of my earlier links this evening was that of the Broadcasting Hall of Fame. Mel Baldwin would certainly be my nominee. Without ANY doubt, Mel Baldwin is not only a fine radio voice, but he, personally, is a highly creative person, plus a very good friend! Much of the success of my radio/TV/film endeavors were a result of Mel's and Ken Finley's writing. AND, I owe so very much gratitude to Andrea Walsh who came out of nowhere and created one of the BEST websites on the I-net. To know her is to love her---> (ask her husband). I'll never forget going down to the old KLAC studio in Hollywood to watch Jim Hawthorne's evening show. The studio was in a quaint, old rambling Spanish stucco complex. My sister and I were hard-core Hawthorne fans. That was over 50 years ago, and I'm still a fan. I remember Daws Butler ("South Pasadena" and "Juan Too") appearing on the show from time to time. It was great. listen to Hawthorne on KWKW, Pasadena. Ranch at the North end of Rosemead Blvd. (I think) the 1948 Presidential Campaign. House green. He even had a campaign song. I remember part of it. and back it with all you've got. he'll paint the White House green. San Diego Zoo with Hawthorne's son, Dar. Good stuff. Dar, a fine, creative production guy. radio stations in the early and middle '60s. KDEO, S.D., WJJD, Chicago, KQV, Pittsburgh and KRLA, L.A. Thank you Jim. You were magnificent. I seem to recall yet another voice hosting Music 'Til Dawn out of Chicago (I think, although it might have been NYC), which was a favorite of mine as a college student in the mid-to-late '50s. A wonderful voice it was. I also have a notion that he (as host of MTD) may have been the subject of an article in Time magazine. Anyone able jog my memory? My name is Fabris G.Luca,40 years old,Italy.I'm an Elvis Presley researcher expecially on the early days. I'm now helping detailing the period from July of 1954 through the end of 1955.
of Elvis' music.We are trying to document every single show Elvis did, and we have come fairly close. ANYTHING IS WELCOME FROM THE 50s!! I'm trying to locate Mr Red Smith Dj then working in 1955 for WBOK radio in New Orleans who helped Elvis a lot back then (he also organized his gig in PortChartrain by the way).Could you help? And also Lynn McDowell working WBIP Booneville Ms in 1955. Do you have friends owning photos or recordings? Your help,anyone's help is welcome! I hope this is not too much of an intrusion. Mel Hall asked if Music Til Dawn on WBBM Chicago had another host besides Mel Baldwin. Prior to Mel's hosting the show, Jay Andres had that role. In the 1960s, I heard Music Til Dawn on many of its national outlets, from San Francisco. I was an avid AM DXer (one who listens to distant AM radio stations as a hobby, for those who don't know). Long distance AM reception works only at night due to atmospheric conditions, and many of my early "catches" were Music Til Dawn programs. I'd tune the AM band after midnight and stop whenever I heard classical music! On a lowly Emerson clock radio in San Francisco I was able to log Music Til Dawn from stations in New Orleans (host Bill Cherry), Los Angeles (host Mel Baldwin), Chicago (host Jay Andres), Cincinnati, Dallas (host Hugh Lampman) and New York City (host Bob Hall). Somewhere I still have the QSL confirmation cards that the stations mailed back in response to my requests, which included sufficient programming details to verify reception. I got KCBS in San Francisco (host Ken Ackerman) the hard way: during a trip to Chicago, on which I flew American Airlines (who else?). Later on I got some much more sophisticated radio equipment and snared a lot of distant broadcasts from around the USA and foreign lands, but the early efforts are fondest in my memory. Sadly, with broadcasting having changed so much over the decades, it's hardly possible to do much AM DXing any more, as in today's cluttered airwaves, many of the "clear channels" in the AM band are no longer clear. Interference abounds! Distant AM listening has joined Music Til Dawn in the annals of history. I met Jim Hawthorne in 1976 when I was hired at KOA-TV, AM & FM. He was a great friend until his death. He was an amazing talent, he had so much drive, he never stopped working and writing. I have some great memories with Jim, great stories he's told me and my stories about times with Jim. Here's an article after Jim passed away. It was my tribute to him in our station newsletter. While it's too bad America's first ever radio DJ and comic actor Jim Hawthorne passed away in 2007 kind of a shame, if he where alive I just wish would've interviewed him to talk about his life and career as been one of the firsts in both radio and TV and of course he made several shorts with future fifth Stooge Joe Besser for Stooge fans out there what they could've developed into a good comedy team in the first place. My mother worked for Mr. Hawthorne way back when. She used to tell stories of working with a particular monkey among other fun highlights. Her name was Dorothy Robbins at that time. Sadly she passed away in 1993.